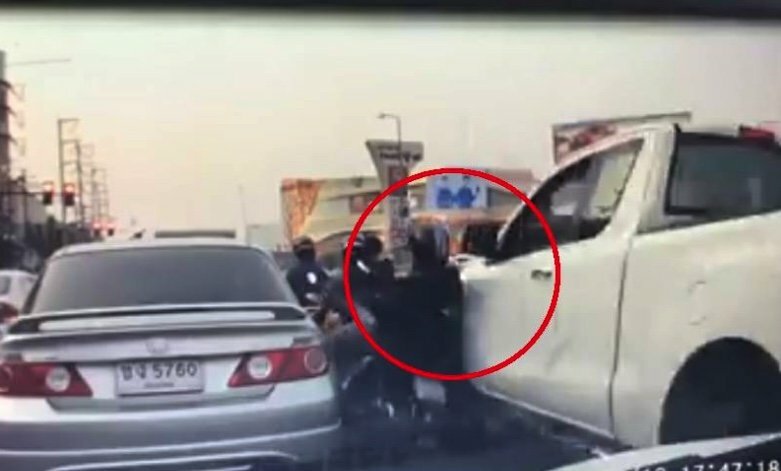 Video footage from the San Dek intersection in Chiang Mai showed a white pick-up hit a stationary motor cycle. The rider - waiting at a red light - does a flip and the bike is damaged but the pick-up driver carries on regardless. Amphan Khempradam went on Facebook to call for people to help by sharing the footage. A police report has been made following the incident at 5.40 pm on Monday. they could have this contest everyday. or would it be every hour? When motorbike riders top the injury lists people blame the bikes but this tells us much about what goes on in reality. That number plate could be brought up and read with the right tools. but the pick-up driver carries on regardless. If the driver had stopped then he/she would have to take responsibility for their idiocy. Sadly a rare trait here amongst road users. The pickup driver is a scumbag. How did the pickup driver ever imagine he could get through that gap. to be caught and dealt with severely,not the usual 500 Thb and a wai. While not condoning the truck driver's actions, they *should* have been able to fit through as the lane is u-turn only and shouldn't be occupied by stationary vehicles looking to go straight on then right as the motorcycle was. The motorcycle should have been a lane and a half to the left. I bet the pickup driver was drunk. Many Thais cant even drive small car properly, they should avoid pickups at all cost. Probably sober, but just a crap driver. There's quite a few here. And I agree with taotoo, the motorbikes shouldn't be blocking the u-turn lane. Actually, watched it again, the pickup driver had room to be further to the right. With so much space at his right side I imagine the car driver was somehow busy with his mobile. Two, to be precise. But he missed the third one. I captured the frame and zoomed in. Cant quite make it out. Would need a higher resolution of the video then could easily identify. Nice job. That's plenty to go on. 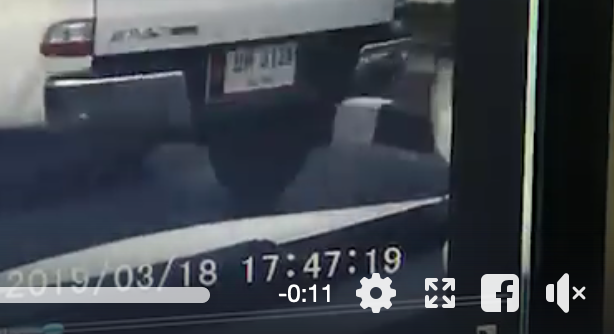 I'm sure the cops have image enhancing tools, and with that detail and time stamp, getting additional CCTV footage of the vehicle further down the road should be easy. I'd go with live streaming !